No matter how much purse strings tighten, vintage boutiques in Edinburgh are bustling. Vintage shopping allows the buyer to invest in classic, one-off items that will be worn over and over again; completely in opposition to the vacuous world of fast fashion. Spread all over the Capital, vintage shops are a bit difficult to find if you don’t already know where they are; this only makes the discovery of a fantastic vintage piece even more satisfying. Vintage is the alternative way to shop and with bargains around every corner, it’s hard not to see the appeal. The best places in Edinburgh to search for something unique, wearable and affordable (not to mention distinctly stylish) are mapped by Ellie and Elyse in the first edition of Nanu Maps. Situated in a surprisingly light and airy Stockbridge basement, TWTDV is a luxury, high-end vintage boutique. Each item is meticulously looked after – covers ensure beautiful beaded dresses remain in their best condition, while their extensive bridalwear collection is available to view up close by appointment only. As well as a fantastic selection of dresses and women’s tops, TWTDV stands out in terms of their accessories. Vintage handbags, which can often look worn, are pristine, and there is a wide range of jewellery – including the star attraction, pairs of Chanel earrings. A gem in Edinburgh’s vintage crown. Another high-end Stockbridge store, Chic and Unique has some stunning piece of vintage sparkle. Time periods from the 1900s to the 1980s are covered – and from regal jewelled brooches to fifties Bakelite plastic designs, you’re sure to find a special piece here. Each cabinet contains notecards, explaining the history of the designer, its consumers, and when the style reached the height of its popularity. This is a lovely touch, and exemplifies how much care has gone into finding jewellery for the shop . For something a bit more fun, Chic and Unique carries a beautiful selection of masquerade eyepieces – setting the tone of the shop perfectly. Armstrong’s is probably Edinburgh’s most famous vintage shop, having been established in 1840. 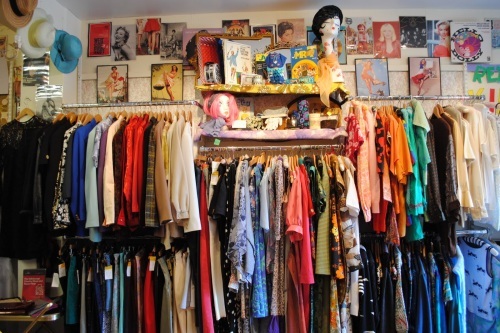 A word of advice: for a first time vintage shopper, the enormous selection in their Grassmarket store could be a little overwhelming, so it wouldn’t be unreasonable to suggest having a look at one of their smaller shops first! In all three stores, retro inspired pieces sit alongside truly vintage items from every era. Dresses, kilts, coats and shoes are in ready supply, but it’s really their selection of cashmere that stands out, a wonderful pastel rainbow of jumpers and cardigans. Armstrong’s is the original place to go vintage in Edinburgh, and it remains one of the best. Herman Brown has the look and feel of a boutique. Its pieces are kept in excellent condition, from their 1980s t-shirts and sweaters to more luxurious eveningwear, resplendent with sequins. Their menswear collection is also kept in good shape, with cosy lumberjack shirts and denim jackets – often forgotten about in the world of vintage. As well as this, Herman Brown also places a lot of focus in their accessory collections. Clearly this is paying off, as their selection of clutch bags and vintage hats is the perfect accompaniment to their well-chosen clothing range. Dispelling the image of the traditional charity shop, Barnardo”s dedicates significant shop space to genuine, quality vintage clothing; the recent revamp of the Nicholson Street branch includes a casino online gorgeous window display of some of the best pieces. The vintage section of the shops boasts everything from 60s dresses, sequinned tops, velvet jackets and woolly cardis, the odd vintage dress pattern and curios. Barnardo”s has mastered the art of not looking like a charity shop which makes your good deed of the day feel even better. This wee shop is an unimposing vintage boutique, close to Edinburgh College of Art. Neatly laid out pieces and welcoming staff create a comfortable and pleasant shopping environment. Garments ranging from the genuinely vintage to retro pieces are well priced and if you”re looking for something special, the shop assistant will be able to help you. A well stocked vintage men”s section towards the back of the shop with pristine shirts and woolly jumpers is one of the biggest draws for stylish boys and androgynous girls. Striving against “the soul sucking monotony of fast food fashion” Godiva is an independent fashion boutique dedicated to producing, reworking and sharing unique clothing for men and women. Located far away from the high street, Godiva is aimed at the discerning fashionista, searching for one off, quality items. The boutique keeps the inviting feel of a vintage shop with suitcases to rummage through and a section of classic vintage-wear towards the back of the shop. However, it is the creative design aspect of Godiva which really makes it stand out from the crowd. One of the new kids on the block, the Frayed Hem hasn”t been open for too long but fits in well to Edinburgh”s vintage fashion scene. A good mix of vintage, retro and restored items are handpicked and lovingly cared for by knowledgeable staff. The walls are decorated with everything from winter coats and jumpers to kitsch brooches and handbags. A good selection of men”s tweed jackets and waistcoats keep the boys entertained, while stylish ladies peer over the cashier”s desk to examine a lovely selection of jewellery.